I tried to play the original Doom once. I found it a bit too janky for my tastes, the lack of proper mouse-look (only horizontal motion) subtly off-putting, ultimately not quite feeling where all the legends came from. I have yet to play the 2016 reboot. I have to concede that this is the “BFG Edition” and judging by the internet that did nothing but ruin a great game (a game which had been lamented in almost every article I’d ever read about it up to that point… how bizarre). Why do I do this to myself? Who knows! 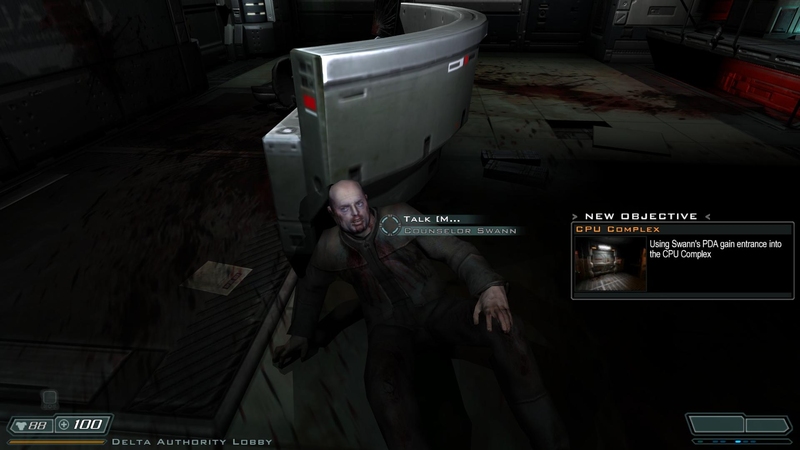 The weirdest thing is that Doom 3 starts off like an RPG. It’s normal enough for an FPS to ease you in gently with a non-combat area, but there are a plethora of little details to absorb on your way from your transport ship to your new captain. 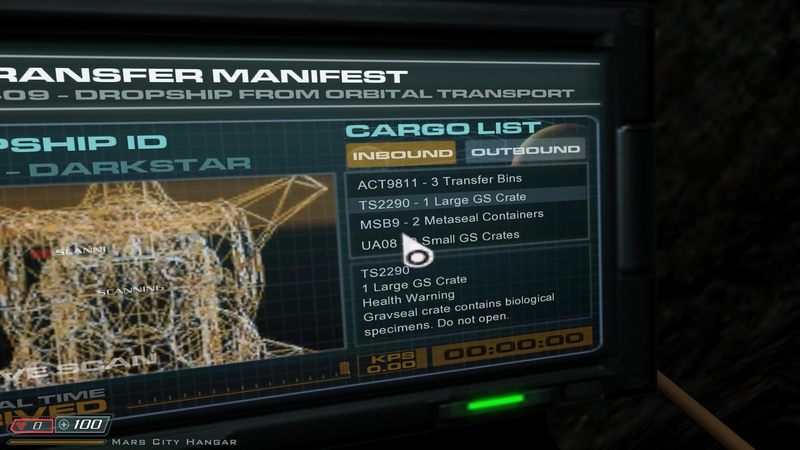 Immediately as you begin, there’s an interactive computer screen that gives some suspicious details for the cargo manifest of the transport you’ve just stepped off — a few “weapons and ammo” and rather more “contains organic material, do not open” and “classified” to set the tone. Move further along and there are people to talk to and conversations to overhear. 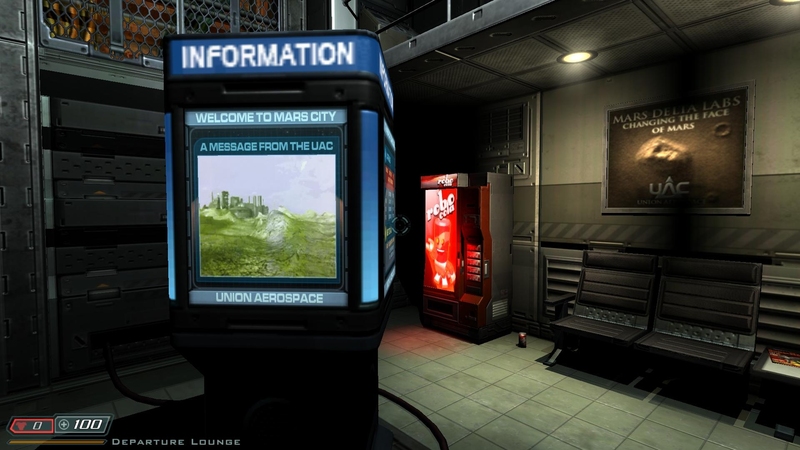 There is an information kiosk playing a very detailed orientation video about working for the UAC on Mars. Once you get your PDA, there are computer consoles with e-mail messages to download. All this, from the direct successor to the original daft run ‘n’ gun shooter! For a few brief moments, it all looks rather lovely. Not that I’m complaining at all. The amount of detail they’ve poured into the world-building is fascinating, and even once the gates of Hell open and the demons start rampaging these details continue. 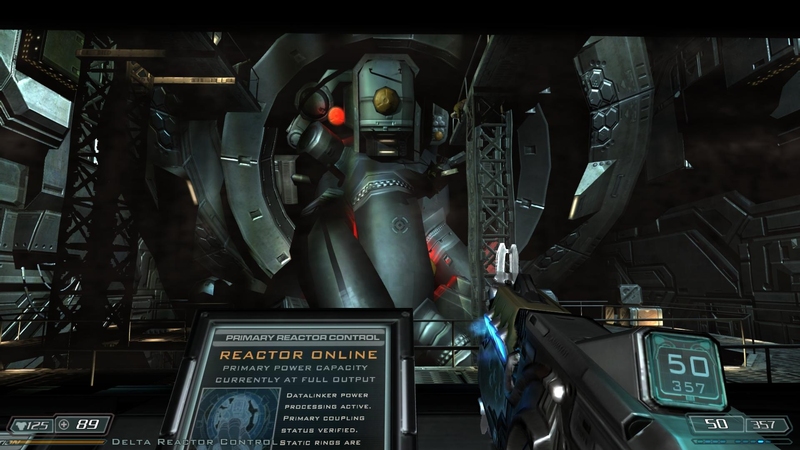 As you traverse specific parts of the facility, for example, more information monitors play videos to introducing some of the miraculous machines you’re walking past. The PDAs of dead workers function as the classic key-cards that allow you to progress, but they also contain audio logs and written e-mails. There are even code-locked crates that offer bonus loot, though this is an area where the game stumbles a little — because the code to any given crate is usually on a log within a 20-foot radius. There’s no exploration required here, it’s still a very very very linear shooter. 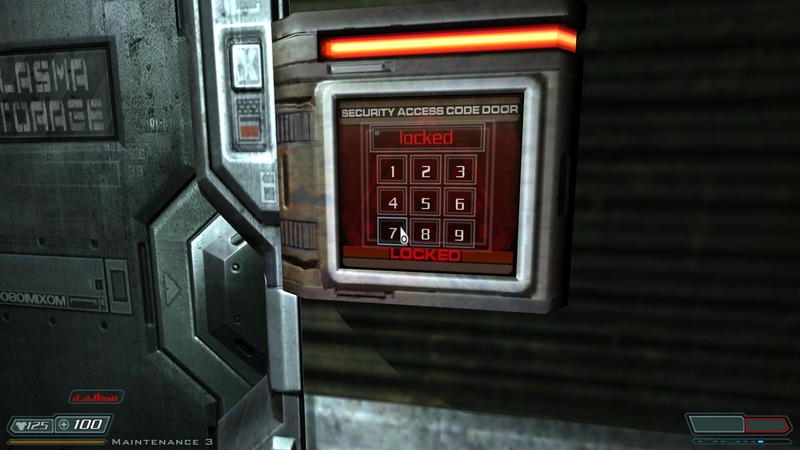 I always love a good key code but it feels like a slightly wasted effort, like they’re here to tick an RPG-lite box the same way cursory multiplayer modes were jammed into singleplayer games for marketing purposes (the gog edition of Doom 3 has multiplayer disabled; I don’t care but you might). And it’s all controlled with those delightful in-world interfaces. Sometimes you get to actually “speak” to somebody dying but mostly it’s audio logs. Okay, so turning Doom into Deus Ex is a thought experiment for another day. What else does it actually have to offer? The environments do get pretty samey after a while. You’re in a Martian base and barring a few very short outdoor areas (like, hilariously short, so short you’d expect them just to have covered over them anyway) it’s a constant set of winding corridors and control rooms. I think the problem I have is that it doesn’t feel much like a meaningful place. 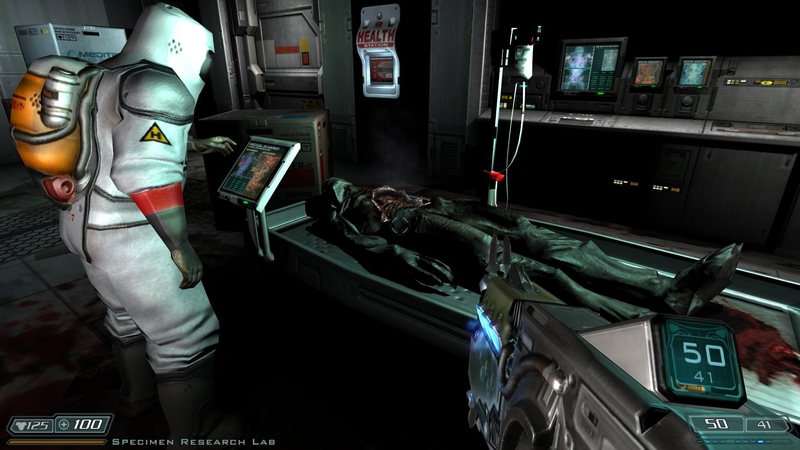 Although there are decorative doors and blocked hallways that suggest places outside the golden path, the rooms that you do visit are connected in strange ways with twists and turns that might make for interesting gameplay spaces but have no plausibility as a Martian research base. Fair enough, this is Doom, we’re not exactly here for deeper meaning, but I think the lack of realism from that angle is what contributes to things feeling so samey. Perhaps if the base was designed as a place first and then twisted into a game space it might have been more interesting to traverse? There are a few very brief outdoor areas where the game actually has lighting. On the other hand, there is plenty of masterful background detail crammed into those odd places. Although most machines are beyond reach, plenty of rooms contain intricate mechanisms of conveyor belts, moving arms and laser beams, all twisting and turning and pumping as you go. 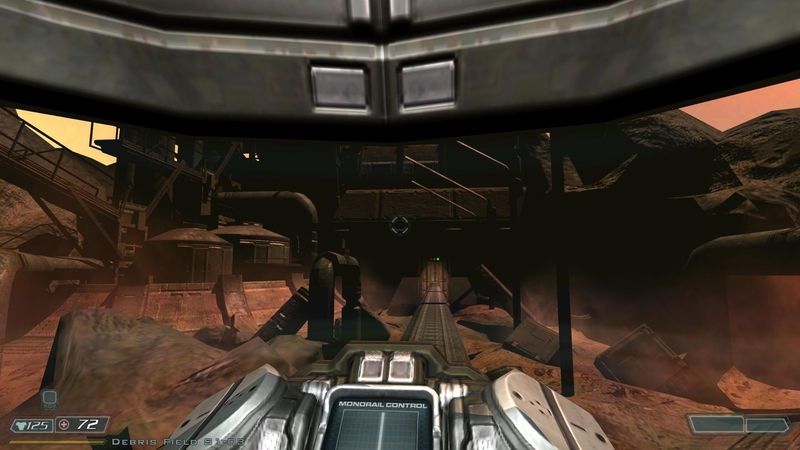 Although, much like the base layout, very little of this makes any sense (it works better in Quake 4 because the Strogg base is built by aliens for alien purposes, whereas Doom 3‘s Mars City is 100% human) it’s beautifully mesmerising to watch the pieces in their endless dance after you’ve cleared an area. Is that really what a power station looks like? Ah, I don’t care, I’ll take it! Little sentry bots provide some well-needed company… about twice in the entire game. Unfortunately the shooting isn’t really all that up to much. 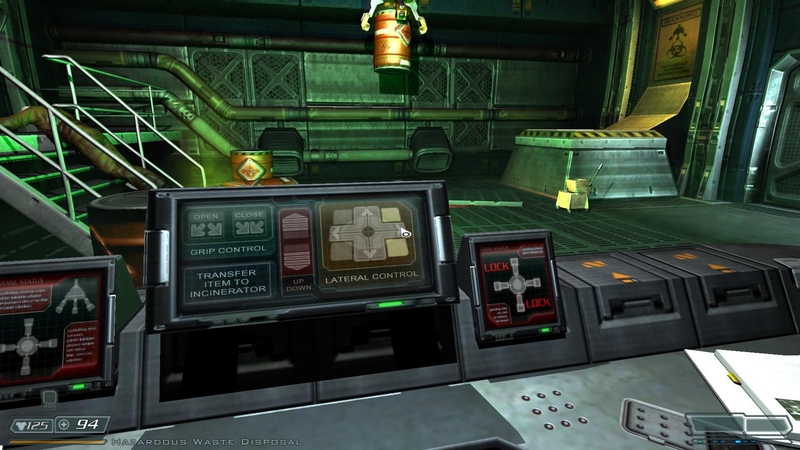 I never thought of the Quakes as particularly charismatic games, but goodness me, Doom 3 is a bit of a slog. The roster has the sum total of zero fun guns — you get a pistol, a shotgun, a machine gun, hand grenades (with such a short throwing range that you might as well not bother), a better machine gun, a plasma gun (an even better machine gun), a rocket launcher… and that’s kind of it. The BFG 9000 makes an appearance far too late in the day (though I was taunted with one in a locked room whose code I never found), and the chainsaw is mildly amusing against easy opponents but the game is so constrained it never feels like time to use it. After going into Hell you do come back with the Soul Cube, which is a guaranteed one-hit-kill that steals health too, but since it requires five kills with any other weapon to recharge it’s more of an irritation than a genuine superweapon reward. I have the horrible feeling that the chain gun actually fires SLOWER than the machine gun. Demonic corpses disappear in a puff of smoke immediately on death, except for this one that has conveniently stuck around to be examined by a scientist. You know what though? I’m still quite enjoying it. It is about as generic as they come and the constant darkness and flickering lights do it no favours, but it’s still devilishly well put together. And perhaps it’s worth it for those stray thoughts that keep bubbling up — ah, what could it have been as a more heavily story-driven FPS-RPG…? If it was an RPG, there would be even MORE barrel puzzles! 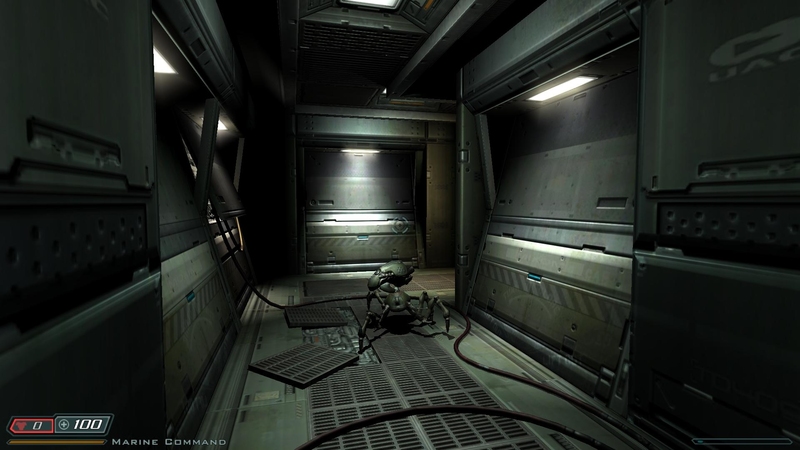 This entry was posted in Gaming and tagged BFG Edition, Doom, Doom 3, id, late to the party, Resurrection of Evil, The Lost Mission by Rao Dao Zao. Bookmark the permalink. Doom 3 did nothing for me. The originals were fast and funky and fun. 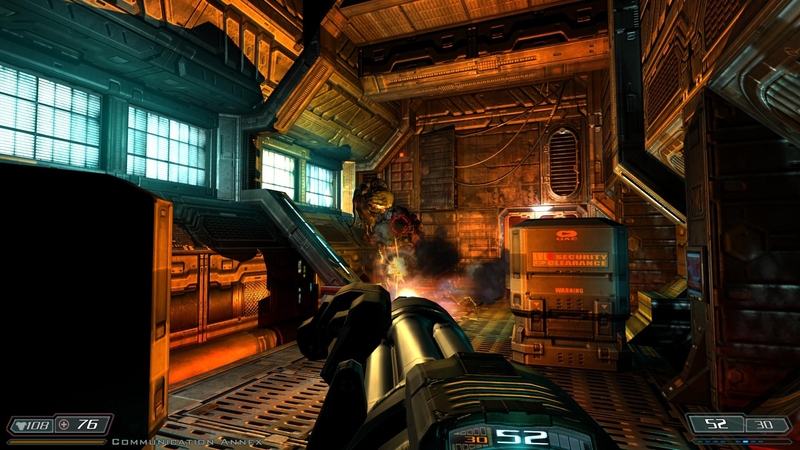 Doom 3 was none of these things. Yes, I played Thief 2 when I was quite young (Sold-Out Software classics range CD, get in!) but got stuck at a super-hard mission and stopped playing. However, I’ve got a very strong soft spot for Thief 3 and have always been meaning to get 1 and then give 2 a proper grown-up go since I’m no longer quite as bad at games.